Once you get your braces on, there are some things you should know about what foods you can and cannot eat. The first few days after you get your braces on, you should eat mostly soft food as your teeth may feel sore. If you have been thinking about losing weight, this is a good time to do it! Avoiding chewing hard or tough foods such as chewy meats, raw vegetables or hard breads, will make eating easier and more comfortable. After a few days, you will be able to eat most foods again. However, there are certain types of foods that should be avoided for the entire time you wear your braces in order to keep your appliances from breaking. If you damage your braces, the treatment time may be increased. Additionally, do not chew on hard items like your fingernails or a pen. These can also damage your orthodontic appliances. For the first 2-3 days after you get braces, your teeth and areas in your mouth may feel sore and tender. Some people experience more discomfort than others. 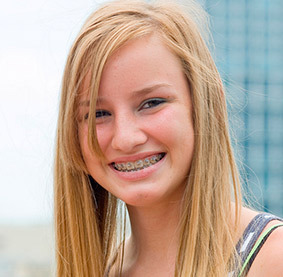 Soreness typically occurs after orthodontic appointments when your braces are adjusted as well. If you experience more severe discomfort, you can take an over-the-counter pain medication such as Advil or Tylenol (the same as you would for a headache). Some people also experience irritation of the cheeks, tongue and even lips for a week or two as they get used to the braces. In this case, wax can be applied to the braces to cover these areas. When you wear braces, it is normal for teeth to become loose. This is OK – your teeth must become mobile to move to the new, desired positions. Once the teeth are aligned and in their final position, they will stabilize. Often times orthodontic treatment involves wearing additional appliances such as rubber bands or headgear. Even though you may not enjoy wearing these things, it is important to work with your orthodontist as a team so that your teeth and bite will align as quickly as possible. Failure to wear these appliances will increase treatment time. People with braces need to floss and brush regularly to maintain healthy gums and teeth during their orthodontic treatment. We also recommend an oral irrigator such as a Waterpik for optimal oral hygiene. It is important to continue to see your general dentist on a regular basis for check-ups and cleanings throughout your orthodontic treatment. Once the braces are removed, patients who did not properly clean their teeth may experience more gum problems and need future dental work. If you have a history of gum disease, you may also need to be checked by a periodontist during treatment. Once orthodontic treatment is complete, you will be given a retainer to wear to hold the teeth in their final position. When you first get a retainer, you may find it awkward or difficult to speak. The more you practice talking while wearing the retainer, the easier it will become to speak. You must take proper care of your retainer to ensure that it is not damaged or lost. Make sure to wear the retainer all the time except for eating and brushing your teeth, unless your orthodontist tells you otherwise. When eating, remove your retainer and place it in the case. Retainers are most often lost in eating places such as school lunch areas or restaurants. Whenever your retainer is not in your mouth, it should always be put in its case. This will avoid loss or damage (they are easy to step on when they fall on the floor!). Take out your retainer when you go swimming in the ocean. Keep your retainer clean by brushing it twice a day with a toothbrush, toothpaste and cold water. This helps to eliminate buildup and odors. You can use denture cleaner periodically, but remember you must use cold water. Avoid retainer contact with heat such as hot dashboards and hot water. Do not put your retainer in a pocket or a napkin because it may end up in the washing machine or trash. Keep your retainer away from pets. They love to chew on them! If your retainer breaks, call us immediately. If there are any questions or concerns, do not try to make adjustments to the retainer yourself. Call us to help. It is costly to replace a lost or broken appliance. If you take a few simple steps to care for your retainer, it can last for many years. In addition to a removable retainer, many patients also receive a fixed, or bonded retainer. This type of retainer is attached to your teeth and cannot be removed, except by the orthodontist or a dentist. Mostly, this retainer is placed on the tongue side of the lower front 6 teeth. It is very important to brush and floss around this retainer (a floss threader is very helpful). If you notice a piece of the retainer becomes loose, please call and schedule an appointment immediately, otherwise a tooth may move out of alignment. If you decide to have the fixed retainer removed, please consult the orthodontist first to determine if another type of retainer will be needed. Wear your expander full time, except when brushing and eating. If you do not have a case with you, leave the expander in so that it is not lost. To activate the expander, take it out of the mouth and place the key into the hole. Push in the direction of the arrow. Only turn the removable expander the number of times the doctor has instructed. Follow the removable retainer instruction care above. To activate the expander, place the key into the hole and gently push in the direction of the arrow (towards the back of the mouth). Gently remove the key once you have completed a turn. Turn once a day unless directed otherwise. Only turn the expander the number of times the doctor has instructed. If you miss a turn, do not turn twice the next day. If you miss an appointment, do not continue to turn the expander. Stop until your next appointment. Remember to brush the expander in addition to your teeth at least twice a day. An oral irrigator, such as a Waterpik, is also highly recommended to help keep it clean. Call us if you are having trouble turning the expander. If you play sports, please inform the doctor. For some contact sports, you will be given a mouth guard that allows tooth movement to continue. Examine your mouth and appliance right away if you receive any injuries or blows to your head or face. If there is any damage to your appliances or you notice a loose tooth, call us and make an appointment. Bands, brackets and wires occasionally do become loose – this is fairly normal. If a wire sticks out and irritates your mouth, you may push it in with a blunt item such as the back of a spoon or pencil eraser, and tuck it in. If you are unable to adjust the irritating wire, place some wax over the area. Call and schedule an appointment for repair. If you have a broken wire, loose bracket or band, unusual pain, or a piece that sticks out and is sharp that you can’t fix, please call and schedule an emergency appointment.